A packraft as defined by Wikipedia is a small, portable inflatable boat designed for use in all bodies of water, including technical whitewater and ocean bays and fjords. A packraft can be used by itself as a means of performing watersports, much the same way a whitewater kayak might be used. More often though, packrafts are used for performing trips that combine hiking with paddling – trips that would be hard or impossible without the use of a packraft. Although gaining more and more mainstream appeal, packrafting is still somewhat of a niche sport, even among the outdoors oriented people. Packrafting can be intimidating especially for those (like me) that do not have previous experience with watersports like canoeing, kayaking or rafting. Yet packrafting as a sport or an outdoor activity is very easy to get started with. This is the start of a four part series that is an attempt to put together an ultimate (ok, a semi-comprehensive, but ultimate sounds better) guide for the beginner interested in packrafting. 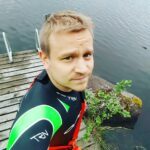 I’m trying to give a beginner packrafter an overview of the things he/she should know when getting into packrafting. Please note: I am going over equipment most of which I haven’t had the possibility to use myself and advertising skills I only have little command over myself. I link to Amazon since they are mostly available everywhere, but if at all possible, YOUR BEST OPTION will almost always be to go to a local kayaking store to see the equipment for yourself. Nonetheless, someone new to packrafting should find it a lot easier to figure out how to get started after reading this series. If reading this series turns a lot of the unknown unknowns into known unknowns and known knowns, then it has served it’s purpose. I’m going to proceed in this order, although you could argue that why to packraft should come before everything and the gear list could be the last. 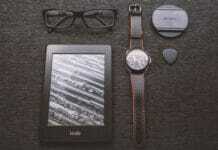 The reason is that I love gear and I think many others do too. Just being aware of what gear there is lets you start thinking about your own whys. I will first present the most important packrafting gear that a newcomer should be familiar with. In the second post, I then present different ways people use packrafts, to give the reader an idea of what a packraft can do. In the third and concluding post of the series, I give a brief overview of the skills needed for successful packrafting trips and present a collection of packrafting resources that are most useful for a beginning packrafter. If you are in Europe, I cannot recommend Packrafting Store highly enough. Their customer service is stellar and they have been active in furthering the sport of packrafting in Europe by bringing available but also developing entirely new affordable packrafting gear. Alpackaraft and Kokopelli sell through their own websites. 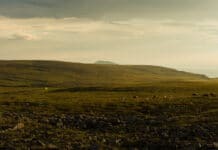 Other websites selling packrafts: Packrafting SverigeAirkayaks.com, Welsh Packraft Store. This list is by no means complete. If you have suggestions, feel free to send me an email. No matter how you look at it, packrafting is not particularily cheap. Consider buying equipment used, packrafts are durable and long lived and can be repaired in case of breakage. Starting with used gear is an easy way to get into packrafting. Here is a list of gear, in order of importance, that is needed for packrafting. Stricly speaking, only 1 and 2 are mandatory and even 2 can be improvised. In general, the rougher the waters, the more gear you will need. To start packrafting, you obviously need the raft. Some consider even cheap vinyl boats more akin to pool rafts than real boats to be packrafts. I am going to look at a some of the different packrafts from very cheap and clumsy to advanced and pricey to give you the reader an idea of what is available, but I will try to draw the line between a pool toy and something that can take at least some beating out in the waters. That way you can also start to get an idea of what would be a suitable packraft for you. At the featherweight end of the ultralight end of the packrafting category lies the Supai Flatwater Canyon, the Klymit Litewater Dinghy and the Alpackaraft Ghost. These lightweight boats (Supai at 690g, Klymit at 992g and Ghost at 595g) are so small that it is feasible to carry them everywhere. The Supai has a buoyancy of 95kg (209lb), the Klymit 158kg (350lb) and the Ghost 115kg (253lb). 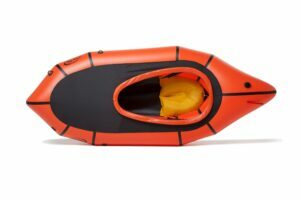 Klymit is inflated with an airbag similiar to larger packrafts, while the Supai has a valve you breath through, with about 30-40 breaths to fill the boat. None of the ultralight packrafts are very stable directionally and the hull speed is very slow. While you can probably manage to get down some rapids on them, they serve better as tools for crossing and on still water. All will get you to places where you cannot go without a packraft, though. Currently at $167 on Amazon, the Klymit is the cheapest non-vinyl toy-type packraft I have ran into and I have one in my ultralight kit. 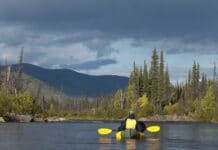 Quick recap: Recognize that ultralight packrafts will carry you but not with speed or elegance. Then pick one you like best based on price/looks/features. Once we step out of the ultralight category, the packrafts start resembling more of what we traditionally think of as packrafts, meaning the de-facto modern shape of a packraft largely crafted by Alpackaraft. Typically the smaller rafts still have no or very little bow upturn (rocker), but the shapes start resembling those of the larger/normal sized brethren. 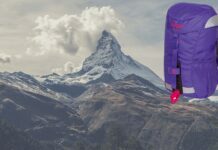 Examples of light packrafts are the Kokopelli Hornet Lite (2150g), The MRS Tulo (2200g) and the Alpackaraft Scout (1600g) and the Alpackaraft Curi-Yak (1920g), which all have a buyoancy in the 115-140kg (250-310lb) range. The price range for the light packrafts is in roughly in the $400 to $600 range. These will handle significantly better and paddle faster than the ultralight variants, but are still no whitewater toys. In the light packraft category, you start to see the dominant players in the packrafting market. MRS, or Micro Rafting Systems is a chinese company. They caused some bad blood when they came out with their own line of packrafts, because the designs very much resemble those of Alpackaraft. Their quality however is held to be very high, in practice similiar to that of Alpackaraft. 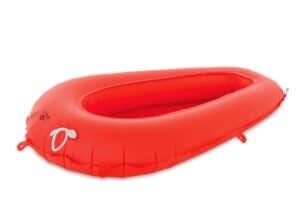 MRS are more popular in Europe where the prices of Alpackaraft are even higher than they are in the United States (where the Alpackaraft are manufactured). Kokopelli is also a United States based company, but they manufacture their equipment outside US. They are known for well constructed packrafts that are often weight a little more than their competition. Alpackaraft is of course the grandfather (or godfather) of modern packrafting and although competition has started to appear, many still hold their rafts are still held as the Cadillacs of packrafting. Quick recap: You start seeing the pricing of the brands here, Alpacka the costliest, MRS in the middle and Kokopelli the cheapest. 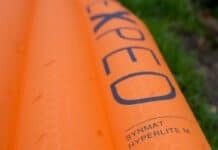 You’re not buying ultimate performance here, so the differences are more minor than in the regular packraft category, so you might want to favor price here. This is the category where the typical packraft fits today. All the largest manufacturers have options with and without a spraydeck (some have several kinds of spraydeck). 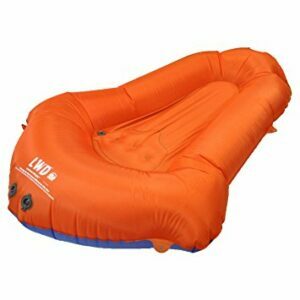 Typically you have different sizes of rafts to accommodate differences in height and weight. The MRS just label these sizes the Microraft S, M and L while Alpackaraft have Alpaca (Small), Yukon Yak (Medium), Denali Llama (Large) and Mule (Extra large). Kokopelli has a Nirvana and a Nirvana XL, although the Nirvana XL and Alpacaraft Mule fit better in the next section, the large rafts. Coming in at the cheaper end of the this range is a German brand called Nortik with their Trekraft, manufactured in Russia (available with and without a spraydeck). The cheaper price can be seen in e.g. heavier weight, but the raft is still very good value for money. All of these will all serve as good general purpose packrafts, allowing you to ride whitewater rapids and paddle still water. Selecting the size is very much a compromise. You should of course fit well into the raft. If you want the boat to handle well in whitewater, then select a snug fit. If you want larger hull speed and more load carrying capacity, then you can opt for a larger one and possibly have e.g thigh straps or other kinds of aids for assuring a tight handling of the raft. In general, the weight of the raft will increase (obviously) as you go up in size. Again Kokopelli is a bit heavier than the other options, mainly due to their use of a heavier fabric (higher denier). Quick recap: Different form factors and feature sets in play here. Ideally you’d test several rafts to identify one that fits your style, but that is often not possible. Just pick one according to your budget and preferences. Lately, a lot of the innovation has happened in the larger end of the packrafts. 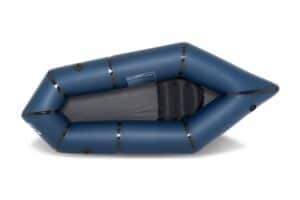 Especially Alpackaraft has a wide range of larger rafts for different needs. If you decide to go larger than the regular size, you should mainly select the raft based on what what you want to achieve. Do you want to fish? Haul people? Gear? Game? No whitewater or some whitewater? One clear benefit that a larger raft has is that it will always be faster than a smaller raft. This will be true both in still water (lakes) as well as in e.g. ferrying over a river. If you are mainly looking at packrafting in still water, then you may well wish to go with a larger raft than you would choose if you intend to navigate rapids or do at least some whitewater play. 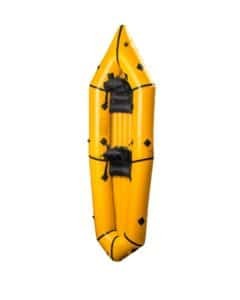 The Alpackaraft Gnu is a two person raft that has an optional spraydeck and can be paddled on knees (Canadian style) having a support between the knees. 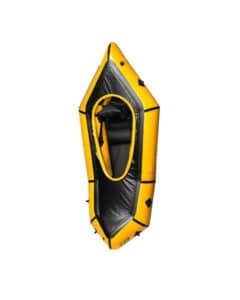 This gives it unique whitewater capability for two people while also serving as a freight hauler or a two person fishing raft. The price is quite steep, however. The Alpackaraft Explorer 42 (For two, get it?) 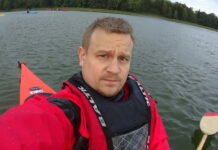 is a two person packraft with shape similiar to the smaller Alpackaraft. The Fjord Explorer has both an upturned bow and stern and it’s the longest and fastest in Alpacka’s range. The Double Duck is a flatwater version of their two person raft. Kokopelli has the Twain which has two seats, and weights in at respectable 13lb 10oz, or over 6kg. MRS Ponto seems to most resemble the Double Duck, optimising for freight hauling with flat shape and low bow. Kokopelli also has XL versions of several other rafts, which can fit two persons. If you occasionally want to raft with your kid, but mostly plan on packrafting solo, then a Large or XL sized regular raft may be the best option. 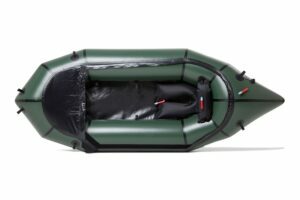 Quick recap: For the larger freight hauling/multiperson models, carefully consider your budget and needs/wants in a packraft and select one that is the best compromise. 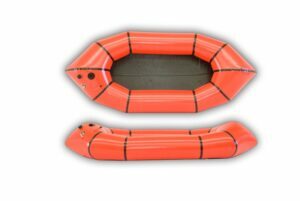 There are some packrafts that are specially designed for white water use. Alpackaraft has the Alpackalypse which they say is the most advanced and whitewater capable packraft ever designed. Weighing in at 12lbs (5.5kg) it’s a heavy raft, but has the handling, rigidity and durability for the heaviest whitewater operation you can throw at it. 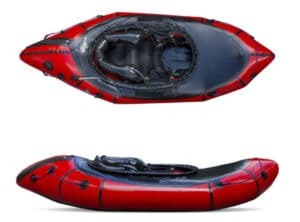 MRS has answered the Alpackalypse with the Alligator 2S (photo courtesy of Packrafting Store) which is similiarly capable, but significantly lighter at 3.5kg. 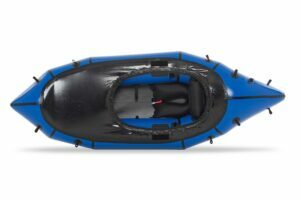 Both of these models start moving towards the territory of regular kayaks (although still at packable size and modest weight compared to real kayaks). Quick recap: For ultimate whitewater capabilities, these are the two go-to models. 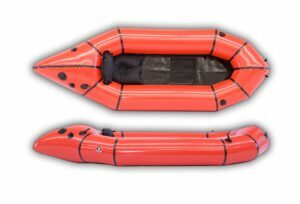 Self bailing packrafts are similiar to larger boat sized rafts used to ride rapids: they have holes in the bottom that allows any water entering the raft to bail out. Some water will always remain at the bottom, but a floor is commonly used to keep the paddler out of the water. Kokopelli markets it’s Nirvana Self-bailer as filling a similiar niche as the Alligator 2S and Alpackalypse. It does have a geometry that lends itself well to surfing holes and other whitewater fun, and the self bailing replaces the need for a top of the line spraydeck (and no matter how good the spraydeck, some water will always get in). It also brings the weight of the Nirvana more in line with other top-of-the-line whitewater options. 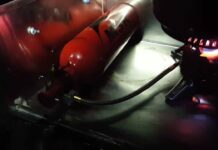 The Aire BAKraft is filled with a pump instead of an air bag, allowing it to be filled into higher pressure. This makes it also a capable whitewater option. In that regard, the BAKraft is said to be more like an inflatable kayak than a packraft. 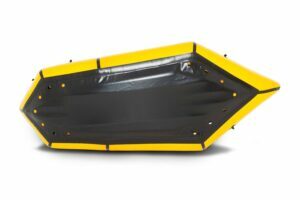 Alpackaraft sells self bailing floor as an option to most of it’s packrafts. It is also possible to modify your own packraft to be self bailing. A company called Feathercraft also made some self-bailing packrafts but it has recently gone under. For use in cold waters (i.e. 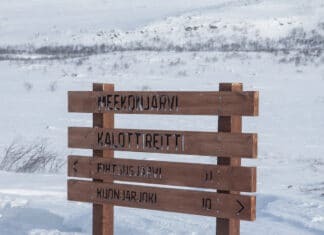 Alaska, Scandinavia) self bailers may be a bit cold: you do not have the spray deck that would keep you warm (a significant benefit especially for long days of rafting) and you have the puddle of water that may eventually get to you. A drysuit (see below) is highly recommended for these scenarios. Quick recap: Self bailer may be a wise choice if you love whitewater rafting and are not worried about temperatures and/or have a good drysuit. When choosing a packraft, you should be advised to consider the type of spraydeck the raft has. With self bailing, you do not need a spraydeck (at least for keeping water out, keeping you warmer is another thing). Alpackaraft lets you choose between a cruiser spraydeck and a whitewater spraydeck. This rough divide into different types of spraydeck can be seen in other packraft makers as well. 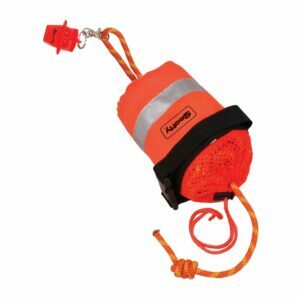 The cruiser spraydeck attaches using velcro and can be totally removed from the packraft, making it an open boat. Regular MRS rafts also have this type of spraydeck. The whitewater spraydeck has a coaming ring and an attached spray skirt. The Kokopellis with spraydeck have a similiar design, as has the MRS Alligator 2S and Nortik Trekraft . The benefits of the cruiser spraydeck is that you can remove it for larger versatility and it is lighter. On the other hand velcro can detach and it is a lot harder to keep it as waterproof as the whitewater spraydecks with coaming and skirts. 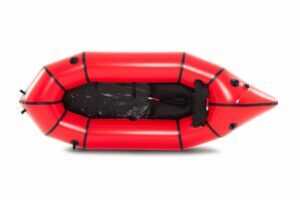 Unfortunately, one size doesn’t fit all when it comes to packrafts. You have to balance your budget, the ways in which you want to use the packraft (whitewater, still water, one person, two persons) and it’s features (spraydeck, no deck, self bailing, how much does it weight). You can’t really go wrong with going with the “normal” models from MRS, Alpackaraft or Kokopelli and if you have the itch, there’s no need to avoid the more niche players either. Packrafts are quite easy to repair by yourself and the whole sport is a niche, with innovation happening in small companies. After you have a packraft, the next most important piece of equipment is the paddle. Packrafters generally favor light paddles that break into multiple pieces. Because the whole idea is to be able to carry your equipment, you want to also keep your paddle small and light. Typical configurations for paddles are four pieces, but some break into as many as seven. Many recommend a paddle about 210cm (82.5″) in length, but paddles between 190cm (74″) to 230cm (90″) are commonly used. I will list some different types of paddles here, so you get an idea about what is available. In the end, you get what you pay for so it’s hard to go wrong. The cheapest paddles will serve you ok, or you can go a little higher for some added comfortability. Or you can go all the way and the the highest end paddle you can afford. All good choices. This is an example of a normal, cheap four piece aluminium paddle. What you get is nothing fancy, but you don’t pay very much either. Packrafting is an expensive hobby to start, so you may want to go with a very basic paddle at first and then upgrade once you know what you are looking for in a paddle. Weighing in at around 1.2kg (42.3oz), this is not the lightest paddle, but absolutely great value for money. This paddle breaks into four pieces and weights only 23oz (650g). If you leave the middle section home, it goes down to 20oz (560g). 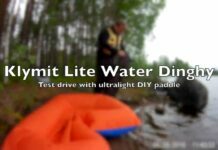 This is not a high performance paddle but a very cheap option for pairing with the ultralight or light packrafts. Notice that the pole diameter is a little thinner than a regular paddle would have. If you have a sub two pound raft, you don’t want a paddle weighing over 2 pounds. This paddle has a carbon shaft with fiberglass blades. It’s a good compromise in price, durability and weight (900g or 31.75oz). Carbon (and also fiberglass) have an advantage over aluminium as the shaft material, because they will be more comfortable to paddle especially in cold weather. The Werner Sherpa is a full fiberglass construction paddle. It has a reputation as an heavy duty paddle that excels in whitewater. Weighing in at 41oz (1162g) it is not as light as the fiber/carbon Manta Ray, but will make that up in durability. 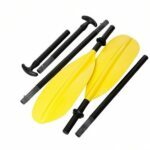 This paddle is a 4-piece paddle sold by Packrafting Store in Germany, although you can probably find similiar offerings from many sellers. 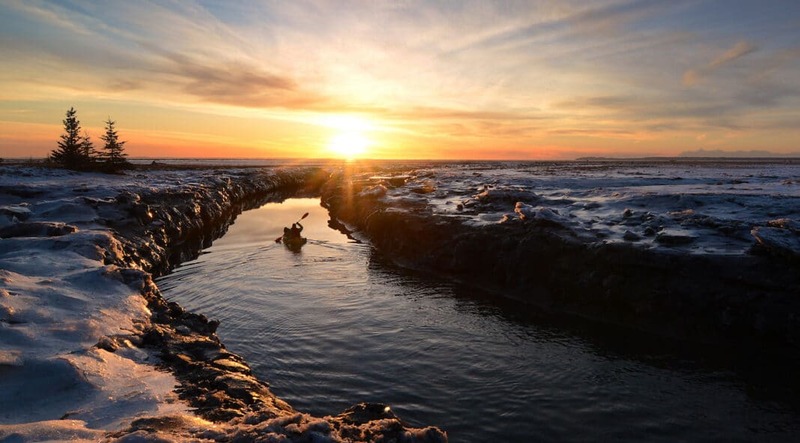 The main use in a paddle that can be converted to a canoe or a kayak style paddle is in use with packrafts like the Alpackaraft Explorer 42 or Gnu, where two people would paddle the raft canoe style, while a single person would want to use the paddle kayak style. Quick Recap: Select a paddle based on your budget first, then your needs. You can manage with the low end or get a lot of paddle for around $100. Only go the high end when you know what you want. Right after the raft and means to propel the raft (i.e. 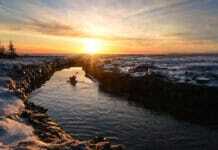 paddle) comes personal safety. A wide variety of PFDs are used in packrafting, from lightweight inflatable vests to regular kayaking PFDs. PFDs used in packrafting are rarely buyoant enough to alone keep a person afloat. Rather they are often a compromise of weight, buoyance and protectiveness. The purpose is to help the person stay afloat and protect from encounters with e.g. rocks if you tip over in rapids. A good example of this is the life vests used by Hig and Erin for their journey of the full length of the Alaskan coast as journaled in the book A long trek home. They modified a Thermarest sleeping pad to have holes for hands. The buoyancy provided was not much, but the double use and weight saving on a 4000 mile trek was certainly worth it. Here I present just a couple of examples of a PFD suitable for packrafting. A PFD from Packrafting Store in Germany, marketed as lightest whitewater capable PFD at 395g (0.87lb). Lightweight, durable and provides full protection for your back. Also material is very non-absorbent for when you are getting drenched often. 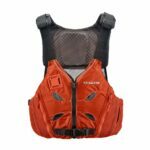 Quick recap: Choose the type of PFD based on your needs. For lots of whitewater use, put protection over weight. A good PFD does not need to cost an arm and a leg. 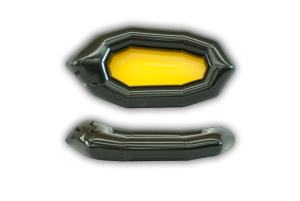 Solid multi-impact (you can continue using it after getting hit) helmet for not a lot of money. 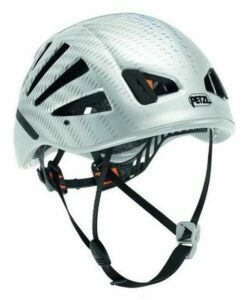 Petzl Meteor 3+ is an older model of the Petzl Meteor helmet. A lightweight (235g, 0.5lb) helmet that is certified for use in climbing, cycling and watersports, this is a ultralight multitasker. Unfortunately the newer models do not have the CE EN 1385 certification. They still work as well, but are not certified. 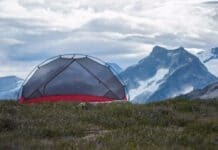 Everyone gets to make their own choice, but especially if you want a lightweight helmet that you might want to climb with too, you should still at least consider the Meteor. Quick recap: If you raft whitewater, buy a helmet. 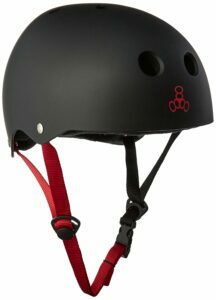 Get a EN 1385 certified one, or one that otherwise fits your purposes but keep your head protected when riding rapids. “A throw bag or throw line is a rescue device with a length of rope stuffed loosely into a bag so it can pay out through the top when the bag is thrown to a swimmer. A throw bag is standard rescue equipment for kayaking and other outdoor river recreational activities. If you ever end up in a situation where you need to drag a friend out of a bad spot, or need a friend to haul YOU out of a bad spot, you will thank yourself if you carry a throw bag. Keep it attached to your PFD, not to the raft. If the river carries your raft away and you are left holding to a rock in rapid current, a throw bag that ran away along with the boat will do you no good. Also, be sure to practice throwing the line when you aren’t in distress. It’s not hard but it does take some practice, which is a lot easier to accumulate when you’re not hanging out of a rock with your other hand. You will also want to carry a knife attached to your PFD. 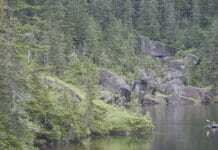 The reason is simple: if you capsize, and get tangled on your raft or your raft gets tangled into a log or fallen tree, or in any number of other scenarios where you can’t get to the surface, can’t get free of the raft or can’t free the raft, you need a knife to unleash yourself or the raft. 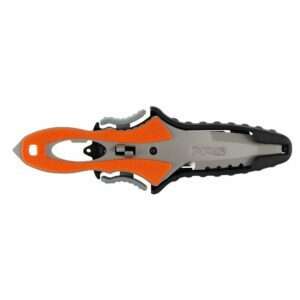 The NRS Pilot Knife is a good option for a knife and serves multiple purposes: a rope cutting hook, glass breaking point at the end of the handle, a valve wrench for an oxygen tank and a bottle opener. If you intend to do anything but a leisure stroll on your packraft, you will want to have some kind of clothing that will keep you dry. Or at least, less wet than you would get without giving any thought to what you are wearing. The gold standard, and the only option if you paddle in seriously cold waters for extended periods of time, is a drysuit. Be aware that not all drysuits are alike. Rather, drysuits come in a a huge number of varieties. 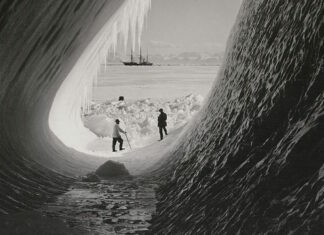 Some are intended to keep the wearer alive and warm in a near freezing sea for several hours. Consequently, they are not very conductive to hours of paddle swinging. Even drysuits worn by people sailing a sailboat are not optimal for packrafters: they are often too heavy and too hot, being designed for lots of wind and not as much movement as a packraft presents. A drysuit used in packrafting is basically a modern shell layer (think gore-tex and the dozens of competitors it has nowadays) that has a waterproof membrane to keep the wearer out of the wet water outside the suit. 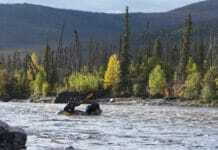 The main considerations for a packrafting drysuit are the weight and freedom of movement. 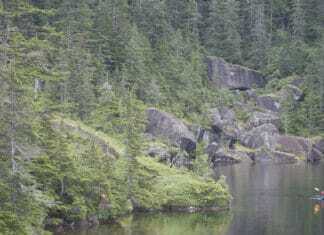 The drysuit should limit the paddler’s movements as little as possible to allow free paddling. Also they are not necessarily designed for warmth. Rather, warmth is adjusted through clothes worn under the drysuit. 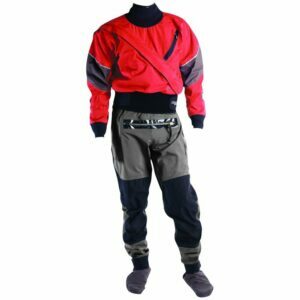 Details you should pay attention to in a drysuit include the neck, cuffs, legs and zippers. Typically you will have latex or neoprene in the cuffs and neck. Feet might have socks or simply cuffs. Latex is the more waterproof cuff option, but neoprene will be more comfortable. Sometimes neoprene neck is referred to as semi-dry as it will let some water in when immersed for long periods. It is still a tradeoff that many make for added comfort. The price of a suit will vary a lot based on the type of fabrics. Two layer fabrics are lighter but less breathable. A full three layer fabrics like the real Gore-tex will be the costlier, but ventilate better and be more durable. A drysuit is not the only option for packrafting. Wetsuits can be used as well. A wetsuit is typically a neoprene suit that is designed to allow a small amount of water to enter under the suit, which will quickly warm and keep you comfortable. Wetsuits are extensively used by surfers and they can be used for packrafting as well. Whereas you would almost always go for a drysuit for an extended packrafting hike, a wetsuit could serve well if you just intend to run some rapids. A wetsuit will take a long time to dry once it gets wet and will not be as comfortable to walk around in as a drysuit, which can approach wearing modern shell clothing. Wetsuits will provide buoyancy that will make swimming easier. Drysuits trap air that makes swimming a bit clumsy. Wetsuits generally restrict movement more, but you can opt for sleeveless versions with a jacket. Aside from a dry- or a wetsuit, regular shell clothing can be used for packrafting. Especially with combining packrafting with hikes this will be a normal scenario. You should try to choose clothes that dry quickly. Merino wool is excellent for underclothes as it keeps you warm even when wet. In these cases you would want to have a good spraydeck to try and keep your clothes as dry as possible. Kokatat is known for it’s brand of drysuits and often used by packrafters. This is a cheaper end lightweight 2 layer drysuit that is not quite as breathable as the best fabrics but good value for money. Similiar option available easier in Europe would be the Anfibio Packsuit Basic from Packrafting Store. This is a full gore-tex drysuit, with 3.6lb (1.6kg) of weight it’s not the lightest suit but will be sure to keep you dry. Being as expensive as it is, your best bet might be to find a store where you can fit drysuits and see that it really suits you before buying. 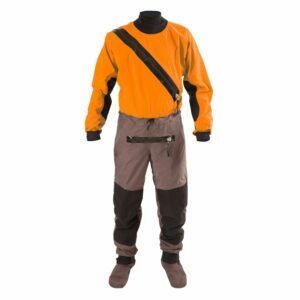 In Europe, Packrafting Store sells a line of drysuits especially designed for packrafting. The Anfibio Packsuit is a modern three layer drysuit that only weights 800g (1.6lb). You can customize the cuffs, neck and feet. The pricing on the packsuits is very competitive and may be worth it for non-European buyers as well to take a look. Check the clothing options on Packrafting store. 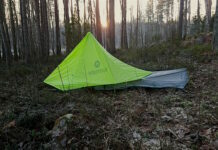 Photo courtesy of Packrafting Store. Quick recap: Wetsuits are a lot cheaper option and you might consider them especially for rafting whitewater only for the purposes of watersports and can get all your equipment dry afterwards. 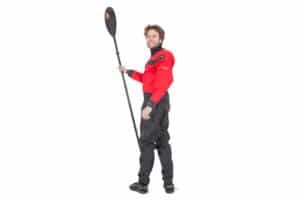 You should seriously consider a drysuit if you do extensive whitewater sports, if you raft in cold waters and/or climate and especially if you do longer trips in such environments. Many like to wear neoprene socks for packrafting, because they keep the feet warm even if there’s a puddle in the bottom of the packraft. And when you inevitably have to wade a bit at some point. The latex/fabric/neoprene sock/shoe portion of a drysuit will serve pretty much the same purpose. Also Crocs, Vibram FiveFingers and other types of non-absorbent sandals are often used to get traction and protect the feet, if you end up walking / portaging on rough terrain or slick stones. Similiar to camp/wading shoes on regular hikes, this is very much a matter of personal taste, so I will leave the shoe/sock selection up to the readers’ discretion. This has been a short look into the equipment typically used / needed for packrafting. Don’t feel like you have to go out and buy everything at once. I conclude with a few suggested kit selections that will get you started. I will give rough estimates for the budget and round prices to nearest $50 to keep accounting easy. If you start with this set, you can gain experience in packrafting on still water. The outlay at the start is the steepest, but it will get you packrafting and I guarantee you will not be disappointed. 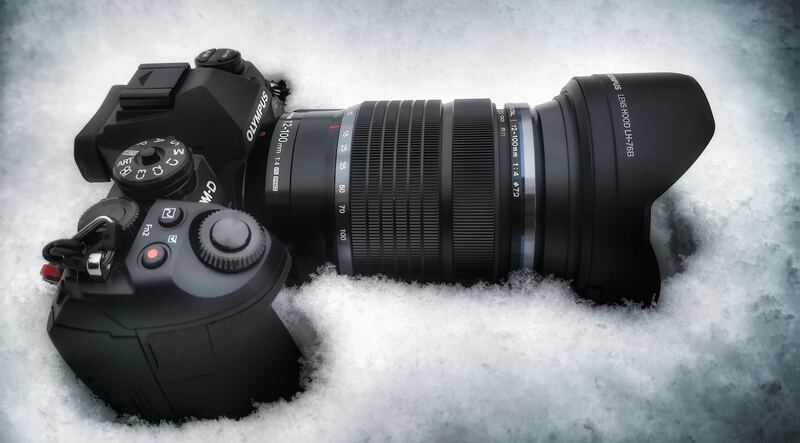 By looking at bargains, and going for the cheaper models, you can easily cut the initial investment down by $200-$300. Used equipment tends to retain it’s price but is also worth checking out for even better savings. 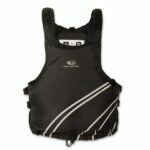 When you are ready to set out for whitewater rafting, you can extend your selection with the whitewater kit. In a pinch, at the very least add the helmet. After that you can upgrade to a drysuit, improved paddle, and so on. In the next part, I look at the various ways to, and reasons for packrafting. That article should motivate you to consider why spending this kind of money on a hobby is actually money well spent. I am a software engineer by day and outdoors aficionado whenever family life allows. 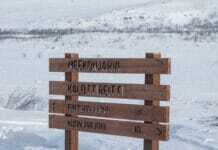 I live in Finland and have roots in Finnish Lapland so arctic outdoors are close to my heart. Special interests include outdoors photography, packrafting, ski trekking and ski expeditions. Just wanted to say that MRS has a dedicated 2-person packraft called MRS Adventure X2. 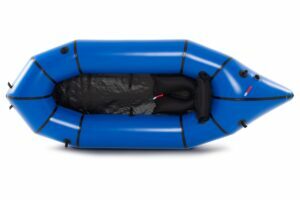 It’s a really nice alternative to the other double packrafts out there. 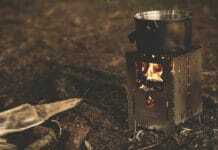 Choosing the right type of stove for your backpacking trips | Out in the Arctic on Using stoves inside tent: safe or not? 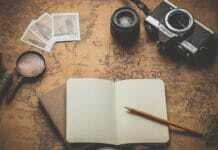 The author is an avid outdoorsman who blogs about treks and ski expeditions in the Arctic region.